J.T. 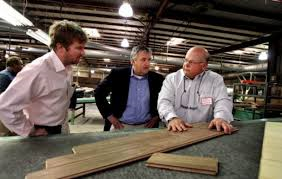 Shannon Lumber Company, Inc., a small business located in Mississippi’s First Congressional District (with facilities in Horn Lake and Hernando), manufactures rough and surfaced lumber, hardwood flooring, and other products for sale domestically and overseas. A fifth-generation company, J.T. Shannon Lumber started shipping internationally after World War II, with primary markets in Europe, China, and Mexico. The difficulty of obtaining a comfortable credit level with new customers eventually led J.T. Shannon Lumber to EXIM, which provided them with a transparent system of determining credit levels and allowed them to increase their borrowing base for international receivables by 20 percent. J.T. Shannon Lumber Company’s insurance broker, World Trade Consult, helped them secure an export credit insurance policy, which they now use to export to over 25 countries. EXIM insurance has covered an average of $5.7 million in J.T. Shannon Lumber Company exports annually over the last five years, and has allowed the company to expand more rapidly into new markets.